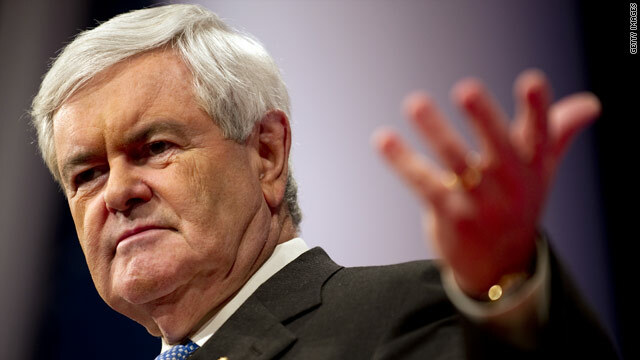 Newt Gingrich has spent time as a Lutheran, a Baptist and a Roman Catholic. (CNN) - There’s an e-mail war raging among some of the nation’s leading evangelicals over whether Newt Gingrich has repented enough for his sins to be president. One recent skirmish was set off by an open letter urging Gingrich to give a major speech confronting his perceived moral stumbles, including an affair with his third wife, Callista, while married to No. 2. “You need to make it as clear as you possibly can that you deeply regret your past actions and that you do understand the anguish and suffering they caused others, including your former spouses,” Richard Land, public policy chief for the Southern Baptist Convention, wrote. Rather than galvanizing the faithful, however, Land’s letter provoked an outcry from a handful of evangelical leaders who argued Gingrich has repented enough and deserves forgiveness. On an e-mail thread among conservative Christian heavyweights, Jerry Falwell Jr. invoked the biblical story of a woman of ill repute who met Jesus at a well. Though the woman had been married five times, Jesus forgave her. “The woman at the well was fortunate she encountered Jesus that day instead of some of our evangelical brethren,” the Liberty University president wrote, in an apparent swipe at Land. On the same e-mail chain, which CNN obtained from a conservative activist, prominent Atlanta preacher Richard Lee said the nation’s evangelicals needed to support Gingrich. The evangelical tussling over Gingrich says a lot about the fractured state of the Republican Party less than a month before the Iowa caucuses officially usher in the 2012 race for the White House. The sight of influential evangelicals rallying around Gingrich, a Catholic with serious “values” baggage, speaks to the huge political vulnerability of Mitt Romney, who was the perceived GOP front-runner until recent polls put Gingrich at the front of the pack. 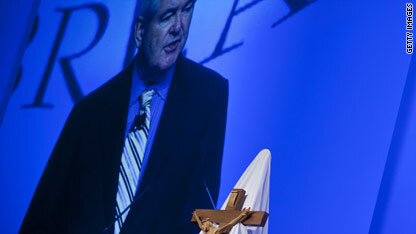 Gingrich speaking at the April 2011 National Catholic Prayer Breakfast in D.C. Whether because of Romney’s past liberalism on gay rights and abortion or because of his Mormon faith, many of the evangelical Christians who make up the Republican base just don’t like him. They’ve been looking for an alternative, by turns telling pollsters of their support for Michele Bachmann, then Rick Perry, then Herman Cain. One by one, they’ve dropped in the polls, or out of the race altogether. Now it’s Gingrich’s turn in the spotlight. But the argument over Gingrich’s personal life also raises fundamental questions about the candidate himself and his readiness for the nation’s highest office. 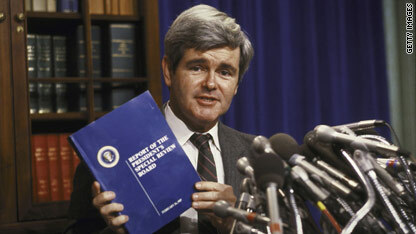 Just how much has Gingrich changed since his days as a volatile and philandering House speaker? Does he have the character to be president? And, at least for many of the evangelical voters who will dominate the early primaries: Is he a true believer? Gingrich has identified with different branches of Christianity that mirror his surroundings at different stages of life. Born near Harrisburg, Pennsylvania, an area settled by the largely Lutheran Pennsylvania Dutch, Gingrich was the son of a Lutheran mom and a Pennsylvania Dutch stepfather who adopted him. Attending college at Atlanta’s Emory University and grad school at Tulane University in New Orleans, Gingrich became a Southern Baptist. And as a creature of Washington, where Gingrich’s wife sings in a Catholic choir and where many prominent conservative Republicans have converted to Catholicism in the last decade, Gingrich joined the Catholic fold in 2009. Gingrich’s stepdad was an army officer, making for a peripatetic family life that included stretches spent at military bases in Europe and at Fort Benning, Georgia, situated in the heart of the Bible Belt. But Gingrich left his childhood denomination through an immersion baptism at the Saint Charles Avenue Baptist Church in New Orleans while at Tulane, where he was pursuing a Ph.D. in European history. In a pattern that would last a lifetime, studying religion’s role in history and politics moved Gingrich to deepen his own faith. Saint Charles Avenue’s pastor, G. Avery Lee, said Gingrich wasn’t a member of any church when the two first met. “He said that in his study of political theory, he noted how much influence the church had had … and asked if I could explain,” Lee wrote in a 1994 letter to the New Orleans Times-Picayune, describing his first encounter with Gingrich. “It has been suggested by some that in baptizing him, I didn't hold him under long enough,” Wrote Lee, who died in 2009, in apparent reference to Gingrich’s conservative politics. But Gingrich was more liberal back then, including on questions of separation of church and state. After Tulane, Gingrich took a job as a history professor outside Atlanta and almost immediately began running for Congress, losing two races in the mid-’70s. Around that time he joined New Hope Baptist Church, a 100-year old congregation south of Atlanta where Ike Reighard had recently arrived as the senior pastor. Gingrich won his next race for Congress in 1978. That year also marked the birth of the modern Christian Right. The movement started in opposition to an Internal Revenue Service campaign under then-President Jimmy Carter to crack down on private schools resisting court-ordered desegregation. Word of the campaign provoked fear and outrage among evangelical schools. Jerry Falwell joined the successful effort to thwart the IRS initiative and founded the Moral Majority the following year, in 1979. The group’s focus on fighting abortion and gay rights set the Christian Right agenda for decades to come. Gingrich, for his part, was not considered part of the new wave of proud Christian Right warriors in Congress, some of whom were swept into power in 1980 on President Ronald Reagan’s coattails and enthusiastically blended their religious faith and politics. Indeed, when Gingrich launched the Conservative Opportunity Society, an influential House caucus, in 1983, he focused on fiscal issues and practical electoral politics. And yet Gingrich was an early ally of the budding Christian Right, even if he wasn’t a card-carrying member. Ralph Reed, who would go on to lead the Christian Coalition, remembers watching as a libertarian activist advocating for gay rights and abortion rights challenged Gingrich at an early 1980s College Republicans breakfast. Gingrich speaking at a 1987 news conference. The future House speaker also stayed active at New Hope Baptist Church, which was quickly growing from sleepy country congregation to suburban Atlanta megachurch, even as he spent most of his time in Washington. When Reighard’s wife died during childbirth, Gingrich was on the phone with him while the pastor was still at the hospital. But a lot of those town halls were more political than religious. Televangelist Pat Robertson launched the Christian Coalition in the early 1990s, and the group organized events around Georgia aimed at getting conservative evangelicals more involved in elections. Gingrich, who counted himself an evangelical, expressed keen interest in the coalition’s work. But he seemed to be operating less as a pious Christian, and more as a strategist looking for ways the GOP could win the House of Representatives. Unlike the Moral Majority in the 1980s, which was made up of pastors like Falwell, the Christian Coalition sought to mainstream the Christian Right by bringing in laypeople. The group’s local chapters were led by Christian business leaders, teachers and retirees, as opposed to pastors. And Christian Coalition envisioned a big-tent religious conservatism that was as much about lowering taxes as it was about banning abortion. For the broad-minded Gingrich, that vision was a perfect fit – especially after the Christian Coalition helped usher in the 1994 Republican Revolution, which put the House in GOP hands for the first time in 40 years. The takeover catapulted Gingrich to speaker of the House, making him the country’s most powerful Republican. He vowed to pay attention to conservative Christians from his first day on the job, seeking to assuage evangelical activists who felt ignored by the Reagan administration after they’d worked hard for Reagan’s political campaigns. Best remembered for working with President Bill Clinton on fiscally focused deals like welfare reform and balancing the budget - and fiscal fights that led to a government shutdown - Gingrich also checked off major items on religious conservatives’ wish lists. He brought a proposed constitutional amendment to allow school prayer up for a House vote. He presided over the adoption of the Partial Birth Abortion Ban Act – the first abortion restriction since Roe v. Wade – and the Defense of Marriage Act, which forbids the federal government from recognizing gay marriage. 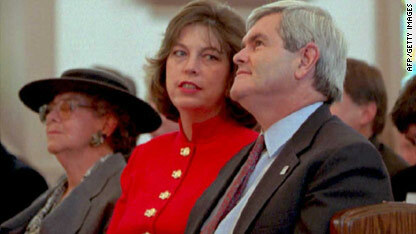 Speaker-elect Gingrich with then-wife Marianne and his mother Kathleen at a January 1995 Washington church service. Yet some evangelical leaders who knew Gingrich fretted over his personal life. The hard-charging speaker displayed braggadocio and rough edges even to political allies and didn’t talk much about his own faith. “There were a lot of conservative Christian leaders who really loved Newt but felt like he hadn’t really turned his life over to God,” says Reed. Many of those leaders went nuclear over rumors about Gingrich’s 1998 affair with a young House aide named Callista Bisek, while he was married to his second wife, Marianne. More than a decade later, Gingrich is back in many evangelicals’ good graces, with polls showing him way out in front of Romney among evangelicals in Iowa, who accounted for 60% of caucus-goers four years ago. One big factor is Gingrich’s self-described faith awakening since leaving Congress in 1998. A personal turning point was 2002, when a court ruling struck down the recitation of the Pledge of Allegiance in public schools because of its “Under God” clause. Just as studying political history had led a 20-something Gingrich to the Saint Charles Avenue Baptist Church in New Orleans, political developments like the Pledge ruling and other perceived attacks on religion sparked a round of soul-searching. Though it was later struck down by the Supreme Court, the ruling led Gingrich to publish “Rediscovering God in America,” a faith-based walking tour of Washington’s key buildings and monuments. For those close to him, the 2006 book reflected what Gingrich had been preaching for more than a decade: that religion played a key role in the nation’s founding. By increasing his public attack on the secular “media-academic-legal elite” and promoting his God-infused take on American history, Gingrich was branded a culture warrior during the last decade, gaining appeal among conservative evangelicals. Gingrich continued the courtship by regularly appearing before audiences of hundreds of evangelical pastors to talk about God, history and politics. “There’s no question there’s been an evolution in his thinking and speaking and writing on America’s religious heritage, which has become a much bigger part of his lexicon,” says Reed, who leads the Faith and Freedom Coalition and is not endorsing any presidential candidates. Gingrich further strengthened ties to grassroots evangelicals in 2009, launching a group aimed at bringing together religious and economic conservatives. The organization, Renewing American Leadership, poured $150,000 into a successful Iowa campaign to unseat judges who had legalized gay marriage in the state. Many of the Iowa activists who led that 2010 campaign are now bullish on Gingrich. Admitting to an affair also helped. At a closed-door meeting with the nation’s top Christian Right leaders ahead of the 2008 election, Gingrich was asked about reports he’d been having an affair while leading the impeachment drive against Clinton after the Monica Lewinsky scandal. The former speaker owned up to the affair and said it marked one the most shameful periods of his life, a time in which he was “alienated from God,” according to a participant at the meeting who spoke on condition of anonymity. Gingrich told listeners he’d since turned "to God to receive forgiveness and to receive mercy." For many evangelicals, the admission and penitent tone struck a chord. “It all depends on whether Newt has been rewired, in the theological sense of being born again,” says David Lane, an influential evangelical activist who is in regular contact with Gingrich. One difference is that, for the last two years, Gingrich has been an active Roman Catholic. He has described his conversion as a decade-long process inspired by Callista, who sings with a choir at the country’s largest Catholic church, Washington’s Basilica of the National Shrine of the Immaculate Conception. Gingrich has said that years of attending Mass there rubbed off on him, with Pope Benedict XVI’s 2008 visit providing the final impetus to conversion. 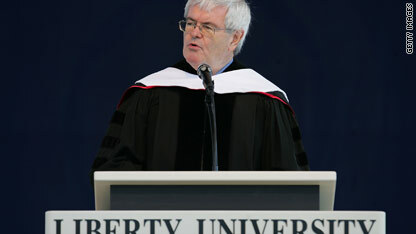 Gingrich was especially drawn to the church’s millennia-long history and intellectualism. Discussing one of his visits to St. Peter’s Basilica in Rome, Gingrich has said, “You stand there and you think, this is where St. Peter was crucified. This is where Paul preached. As opposed to being a letdown to evangelical leaders, Gingrich’s conversion away from evangelical Christianity was received as something like a born-again experience. But Gingrich still has to convince some religious leaders he has straightened out morally. In his letter to Gingrich urging a speech about his marital history, the Southern Baptist Convention’s Land told Gingrich to emphasize his own religious narrative. If polls are to be believed, the story of Gingrich’s journey is resonating already.